Very affordable pedal with lots of tonal options. Should work great for all genres of music. 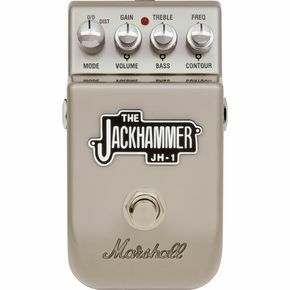 The Jackhammer is built in a tough roadworthy light gray enclosure which is shared across the whole Marshall line of stompboxes. It has 1/4 inch input and output sockets, on/off switch with LED indicating "On" position. There are controls for "Mode", "Gain", "Volume", "Treble", "Bass", "Contour" and "Contour Frequency". The JH-1 can be powered via a 9 volt battery or a 9 volt adapter (not supplied). The Jackhammer is a dual mode stompbox, it can operate either as an overdrive or as a distortion pedal. According to the manual the overdrive mode gets close to the character of a JCM800, while the distortion is close in voicing to the JCM2000 series Marshall amps. The Gain and Volume controls are stacked on top of each other, as are consequently the bass and treble controls, and the contour and contour frequency knobs. This makes the operation a little cumbersome at first but looking at the size of the unit it is amazing that Marshall have managed to put so much tonal control in a box of this size. The controls are little hard to get used to, due to their diminutive size, especially when a minor adjustment might need to be made in the middle of a show. I was actually amazed how "Marshall" this small box sounded - right after plugging into it the Marshall character was instantly recognizable. The overdrive provides plenty of tonal options from blues to hard rock, while the distortion takes things further into metal territory. The overdrive works wonderfully for juicing up a tube amp - in this case my Marshall JCM900 and Marshall VS8100 amps benefited from the extra boost and sustain from the overdrive setting. The distortion mode also sounded great through an amp's clean channel and the contour allowed enough control that there was always enough flexibility to dial in a convincing sound. On certain amps the pedal on the distortion setting felt a bit bass heavy, but again - this was something I managed to dial out by using the amps' and pedals' eq control. Overall the JH-1 is a very versatile unit and for those musicians looking for a distortion unit and an overdrive at the price of a single pedal this unit is a definite must!